Chicago on "America by Amtrak"
The second Destination City on a dream Amtrak train trip covering 25 states on 6 Amtrak Long Distance Trains on 7,638 rail miles by a 74 year old dad, Carl Morrison, and 42 year old son, Matthew Morrison. Chicago's famous "L" (for elevated) above street and waterway. The first "L", the Chicago and South Side Rapid Transit Railroad, began revenue service on June 6, 1892, when a steam locomotive pulling four wooden coaches carrying over a couple of dozen people departed the 39th Street station and arrived at the Congress Street Terminal 14 minutes later, over tracks that are still in use by the Green Line. The Chicago "L" (short for "elevated") is the rapid transit system serving the city of Chicago and some of its surrounding suburbs in the U.S. state of Illinois. It is operated by the Chicago Transit Authority (CTA). It is the fourth largest rapid transit system in the United States in terms of total route length, at 102.8 miles long. The "L" consists of eight rapid transit lines laid out in a spoke–hub distribution paradigm focusing transit towards the Loop. Although the "L" gained its name because large parts of the system are elevated, portions of the network are also in subway tunnels, at grade level, or open cut. California Zephyr, Capitol Limited, Cardinal, City of New Orleans, Empire Builder, Hiawatha, Hoosier State, Illinois Service, Lake Shore Limited, Michigan Services, Missouri River Runner, Southwest Chief, and Texas Eagle. Amtrak Destination City, Chicago, Illinois, Center of the Amtrak System. Our accommodations while in Chicago, about 4 blocks from the station, was the Holiday Inn & Suites Downtown Chicago, 506 West Harrison Street, Chicago, Illinois. As it turned out, this was the hotel of Amtrak crews as well. My long-time friend, Bob Williams came in from Huntley, Illinois on Metra Rail each day to help us take luggage to the hotel or take us touring around downtown Chicago. View of downtown from our hotel. 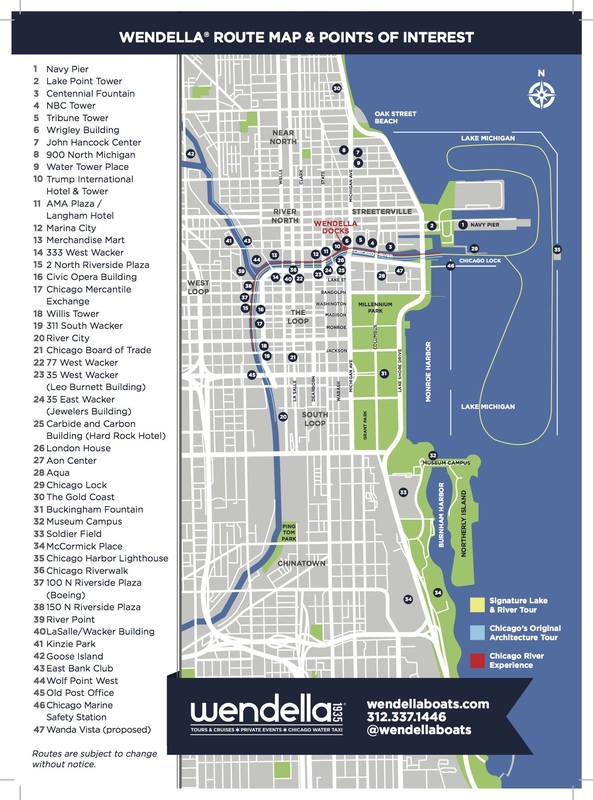 Popular bike rentals near Metra Stations. All handled by credit card for check out at one location, check in at another. Divvy is a bicycle sharing system located in the City of Chicago operated by Motivate for the Chicago Department of Transportation. It operates with 5837 bicycles at 576 stations in an area bounded by 75th Street on the south, Touhy Avenue on the north, Lake Michigan on the east, and Pulaski Road on the west. The bicycles are utility bicycles with a unisex step-through frame that provides a lower center of gravity and ease of access to a wide range of heights. All bikes are painted "Chicago blue", with the exception of one "unicorn bike": a bright red bike, dubbed #Divvyred. Divvy bikes have three speeds, a bell, and a front rack. Each day we met at the Starbucks in Union Station since Bob came downtown on Metra and we walked from the hotel. Matthew explaining something to Bob as we walked in downtown Chicago. I like the light on the St. Peters Church on this Sunday Morning July 10, 2016. This 568-foot tall skyscraper is the tallest church building in the world. It serves as a Neo-Gothic monument to the Methodists’ commitment to the Loop at a time when pressure was great to move to the suburbs. It is home to the First United Methodist Church of Chicago, the oldest congregation in the city. The tower houses the "Sky Chapel" at its highest level, a sanctuary on the ground floor and office space on the floors in between. Sanctuary 1 is four stories tall on the ground floor with seating available for 1,000 people. Sanctuary 2 is also known as the "Dixon Chapel" and is on the second floor. Sanctuary 3 also known as the "Sky Chapel" is the smallest sanctuary and is situated at the base of the steeple with seating for 30 people. Picasso's gift to the city of Chicago in 1967 at the Dailey Plaza. There are green bike lanes throughout downtown and here between the street and Chicago Temple's sign. Matthew, himself a professional organist, talks with the church organist after the service. The congregation was founded in 1831 and built a log cabin on the north bank of the Chicago River in 1834. In 1838, it moved the cabin across the river to the corner of Washington and Clark Streets. (depicted in a satined glass window above) The current structure was completed after a debate within the congregation whether the church should remain in central Chicago or sell its valuable property and relocate to the growing suburban areas. Patio of the church's senior pastor's parsonage on top 3 floors of the spire. Floors 5 through 21 of the building are rented office space with one residential area which is used by the Methodist church's senior pastor as a parsonage, occupying the three floors of the spire, just below the Sky Chapel. The sixth floor of the building once held the office of Clarence Darrow, the famous trial attorney. Bob knew of a tour to the chapel after Sunday service which we enjoyed immensely. Luke 42:19 is the basis of the altar artwork. Bob Williams' photo of me checking the photos that I shot at the Chicago Temple. Always a good idea before you leave a special place to make sure your photos were good, even better to check each photo on the replay screen as you take it. All stained glass windows are florescent lights and white box behind them, none have outside light behind them. They have a PC Code on all the windows with the history of the Bible or of the Church as the basis. Some artwork on the windows are of life in the 50s. Bob thought the lady with a scarf looked like his mom in the 50s. We both noted the absence of cars was not characteristic of the 50s. Some things you never forget how to do. Some non-farmers think that if it has horns it is a bull, but trust me this is a cow and has the plumbing to prove it. I noticed that the pupil of the cow's eye was the Picasso sculpture. Millennium Park is a portion of the 319-acre Grant Park, known as the "front lawn" of downtown Chicago, and has four major artistic highlights: the Jay Pritzker Pavilion, Cloud Gate, the Crown Fountain, and the Lurie Garden. Bob took a photo of Matt and me starting our photo shoot of The Bean. Hopefully my decades-old suede and leather JanSport backpack does not look like it contains valuables. Everyone wants a self-portrait in or of the Bean. While walking through the sights of downtown Chicago, we repeatedly passed under the "L". I mentioned to Bob Williams that I had seen the "L" many times, but had never ridden it. Within a block he had us going up stairs from street level to a station. This is where having a local guide is priceless. Bob (above, left) studied the CTA map while I shot photos without regard to station stops and Matt just relaxed. As it turned out, Bob had us board the "L" within the "Loop" so we need not change trains to get a nice sampling of the train system. Additionally, it was perfect for photos because it involved 90 degree turns where I could photograph the front of our own train as well as other approaching trains. Of course, Bob said, "I planned it this way!" Stations are well marked since one cannot see street signs as you would at street level on a bus or in a car. Advertisements in adjacent buildings need to be in second story windows. Trackside billboard space is available as well as seen in this Al Capone movie ad whose name long-time Chicago residents will know. Other first-timers were enjoying their ride on the "L" in addition to Matt and me. He and older brother had a Local Guide as well to point out sights--Mom and Grandma. Better to ride above the bus and car traffic in my opinion. A full-length photo of an oncoming train is one advantage of riding the "L" within the "Loop". From this elevated train ride, one can see Lake Michigan past the Nichols Bridgeway to the Art Institute. Emergency procedures are well posted. After detraining at the conclusion of our circle tour, Bob suggested staying on the platform for additional photos. This map, on the platform, helps travelers know about CTA train and bus connections. Quite a spaghetti bowl of switches at intersections. A slight elevation change behind the train makes it easier to show more track in a photo. It won't take long on a platform to see a train meet in the station. The end of a station platform is a good place to get a photo of an engineer. Bob returned home after our "L" ride, so Matt and I took a water taxi (Red line) from Union Station/Adams Street to Navy Pier. Bob had walked across Adams St. bridge to Union station and took this photo of us. A plain dressed Amish, Mennonite, Brethren, or Quaker family, that travels by train, watch activity on the Chicago River directly below Union Station in Chicago at Adams Street Entrance. Same family as above, but showing that trains come into the Chicago Union Station on the lower level and the exits from the station are upstairs on street level. Below the track level is the river. Chicago Police pass below Union Station on the Chicago river flying the Chicago flag. On the water taxi from Union Station down the Chicago River to Navy Pier, we pass a modern building built with the same curve as the river. New skyscrapers still being built in Chicago. Kayaks for rent on the river beside the River Walk. We observed several kayaks pulled to the side to avoid the many water taxis and tour boats on the river - not a place for a beginner in my mind. Restaurants, seating, and river walk along the river downtown. Round condo building with parking below. Ferris Bueller's Day Off film used this garage. Matt taking in the Chicago Skyline from the Chicago River water taxi. Just across the street west of Navy Pier was this unique water fountain with fog being enjoyed by some families. On to the east end of Navy Pier, the late afternoon light worked on the lighthouse and 4-masted "Windy". With "Windy" moving slowly, I caught it with the Chicago Harbor Light through the rigging. Later, with sails down for more maneuverability in the harbor, "Windy" passes the Chicago Harbor Light again. Onshore winds made the many flags on Navy Pier stand out proudly. Designed for visitor participation, lie on the couch and pour out your troubles to bronze Bob Hartley, the 1970s psychologist from The Bob Newhart Show. Created by Studio EIS in New York, the life-sized statue was commissioned by nostalgia cable channel TV Land and unveiled to the City of Chicago on July 27, 2004 by the company’s president Larry W. Jones. In November 2004, the statue was moved to Navy Pier. Matt asked Sam Adams where we could find a bit to eat. The setting sun provided some nice panoramas of the Chicago skyline. The Ferris wheel was under construction and reopened on May 27, 2016. A new model was selected and purchased—the DW60—from Dutch Wheels, the Netherlands-based company that built the pier’s former wheel. The state-of-the-art DW60 is the first and only one of its kind in the U.S. with similar wheels currently in operation in Hong Kong and Baku, Azerbaijan. Significant features include two-sided cars that allow for easy loading and unloading, a fortified structure to withstand winds of 115 miles per hour, and safety glass capable of weathering intense storms. The ticket booth for the Ferris wheel had a chrome covering, so what not a selfie? Keep an eye on both the south and north sides of Navy Pier facing west. Matt disappeared for a few moments and returned with a photo like this on his iPhone, so I rushed to the north side of the pier for this shot. With a 1 sec. exposure, I was able to get the moon, swing ride spinning, and even people on the moving swings. The Merry-Go-Round on Navy Pier with Chicago downtown background. We didn't need a nightcap, but the sign was neat. We took Uber back to our hotel from Navy Pier. With our 3rd day in Chicago, we had until 6:40 p.m. before we left on the Capitol Limited for Washington, DC. Bob met us again at Union Station and we took this nearby Water Taxi (above) downtown to meet a Wendella's Chicago River and Harbor Tour. A sister Wendella sightseeing boat to ours and the Chicago skyline. A Chicago family tradition since 1935, this is the tour that started it all. This unique excursion tells the story of more than 200 years of fascinating social, cultural and political history, and explores more than a century of groundbreaking architecture. The journey begins with an up-close perspective of Chicago’s internationally-known architecture as seen from the Chicago River. Then venture through the Chicago Lock on to the calm, cool waters of Lake Michigan for expansive views of Chicago’s extraordinary 26-mile skyline. Take the selfie of a lifetime on this inspirational experience! Click the Map of our tour above for a larger, readable copy. This time under Wells Street Bridge, I caught an "L" train on the bridge. Matt enjoying the top deck. Bob doing fact checking of the tour announcer. Water through the partially opened locks to lift our boat to lake level. Navy Pier from Lake Michigan. Chicago Harbor Light up close. The light was constructed in 1893 for the World's Columbian Exposition and moved to its present site in 1919. In 2005, the light was declared excess by the Coast Guard. United States Secretary of the Interior Kenneth Salazar initiated transfer to the City of Chicago on February 24, 2009. Sailboats, Monroe Harbor, and Chicago skyline south of Navy Pier. A condo building with Trump's name. "Many developers pay Donald Trump to market their properties and be the public face for their projects. For that reason, Trump does not own many of the buildings that display his name." Tall building where you can walk out into a glass box far above street level. Chicago skyline, "L", and vents on the top of our tour boat. Building top designed to look like the top of a bottle of champagne. Lunch at a famous Chicago restaurant, Grand Lux Cafe. Chicago water tower one of the few buildings to survive the destructive path of the Great Chicago Fire of 1871. The Buckingham Fountain photo is HDR. I did not take my tripod so I used the fence to brace my photo for a 3-shot burst. Another pass under the "L" heading back to Union Station for our Capitol Limited train to DC. Bob had his son, Andrew Williams, (center) meet us on the street corner below his office building for a photo with Matt. Andrew Williams works at 300 South Wacker Drive with a map graphic on the river side. A new Amtrak information kiosk in the large waiting room of Chicago Union Station. We left our luggage in the Metropolitan Lounge in Chicago Union Station after we checked out from our nearby hotel, Holiday Inn Express in the morning. We did all the sightseeing for the day, knowing it was secure. After returning for our 6:40 pm Capitol Limited train for DC, we retrieved the computers from the luggage area, rested and enjoyed some refreshments in the Lounge before our train was called and took the rest of the luggage to our Superliner. To accept, use code 'carlm3106ue' to sign up. Enjoy! Back to the Table of Contents of "America by Amtrak"